Good steak in London can cost a lot of money and the area around Piccadilly and Soho is a good example of this rule of thumb. MASH serves up some excellent steak, but at very high prices. Flat Iron is completely different. In contrast to the plush surroundings of MASH or the refined, clubby environment of a Hawksmoor, Flat Iron has a deliberately worn down look full of bare timbers and distressed light fixtures that betrays its origins as a Shoreditch pop up. The biggest difference though is in the menu. Instead of offering a wide variety of expensive cuts that simply confuse most people, it only serves one type of steak – the eponymous flat iron also known as feather blade – at a low price of just £10 per serving. Flat iron is a flavoursome and tender, yet inexpensive cut of steak that has only recently gained prominence. I freely admit to never having heard of it before and remained sceptical of its merits until I started eating it. While the thin slices of steak cooked medium rare, as recommended by the kitchen, wasn’t as tender as sirloin it certainly wasn’t far off – if you feel the need to cut it, your amusingly shaped knife will meet very little resistance. Best of all is the flavour – lightly seasoned with some salt, it has a surprising and addictive earthy, mustardy taste that is very distinctive and has to be eaten to be believed. It’s deceptively simple and utterly delightful. 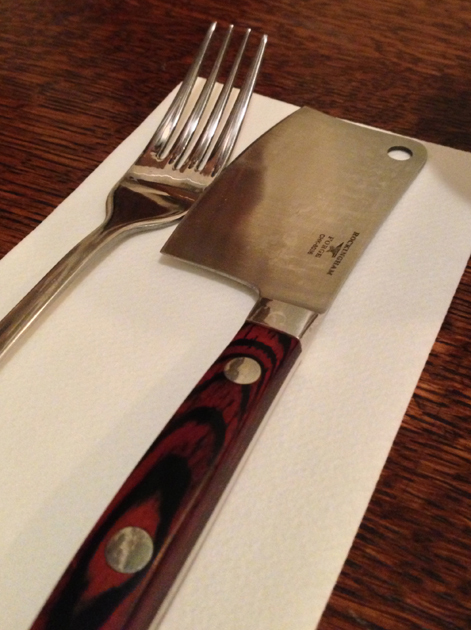 This isn’t the place if you like deliberating between rib eye, sirloin, bavette, chateaubriand etc. I don’t usually have sauces with my steak, but the oddly-named Fred’s sauce is worth a look. Somewhat similar to steak tartare dressing, the tomato, chilli and caper-based sauce is served cold and all three elements are bold and flavoursome although they can overwhelm the already extant flavours of the flat iron steak. 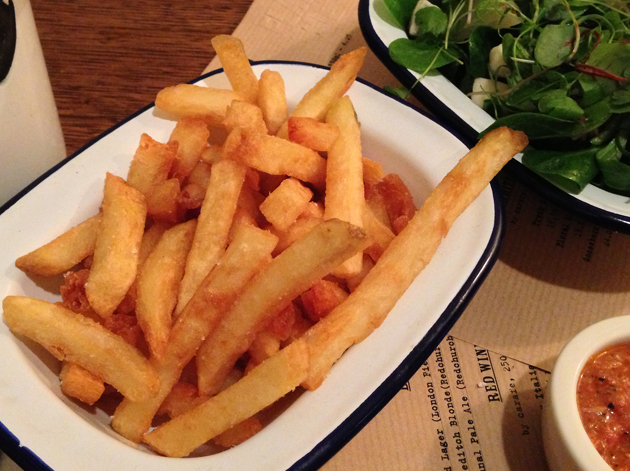 The chips cooked in beef dripping are really fries, but they’re very good fries. The thin bits of potato are evenly crisp, oil-free and have occasional hints of fatty beefiness that even Hawksmoor’s otherwise-perfect beef dripping chips fail to capture. 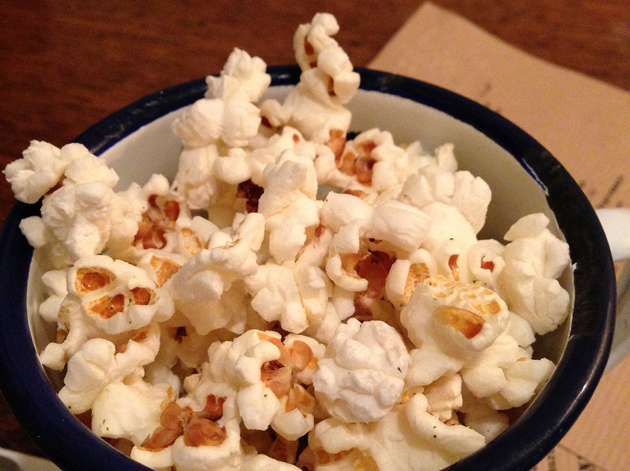 The same applies to the beef dripping popcorn. I’m guessing that instead of popping the corn in the usual butter and/or lard, the kitchen has used beef dripping and it imparts tinges of fatty beefiness onto the popped kernels that is very moreish. The herby leaves in the oddly-named Sophie’s salad are dressed with cubes of anonymous blue cheese, candied pecans and lemon dressing. The leaves are refreshing, but the small cubes of cheese and the meagre, crushed scatterings of pecan are too insignificant to make much of an impact. This isn’t Sophie’s salad, it’s mine. I sometimes to have revisit a restaurant several times to get a feel for the large menu or to sample more dishes to help make up my mind, but that’s really not necessary here. 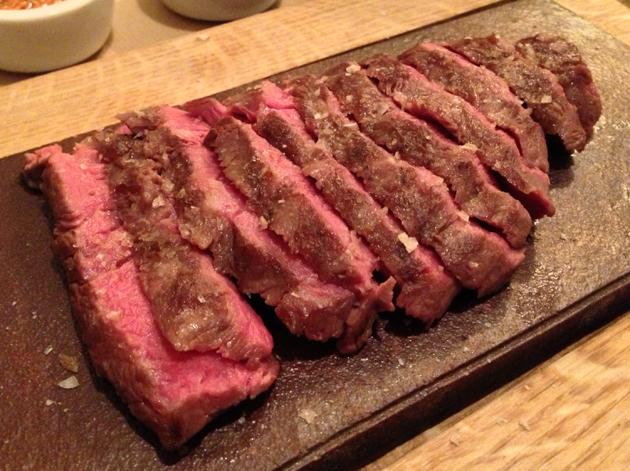 The steak at Flat Iron is simply superb and is great value too. 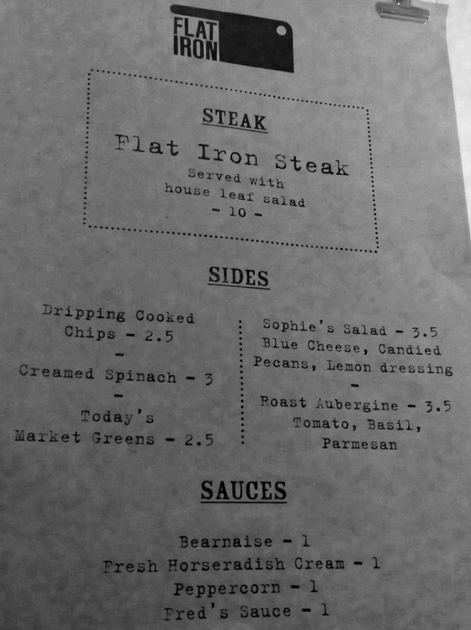 If I had to nitpick, the portion of steak is a tad small but then you can always order another helping at just £10 a pop. The kitchen intends to start serving cuts of wagyu beef at some point in the future, but even if that doesn’t happen I can see myself spending far too much money at Flat Iron. Reservations aren’t taken and there are only about 20-25 covers on the ground floor, so get there early or be prepared to queue. 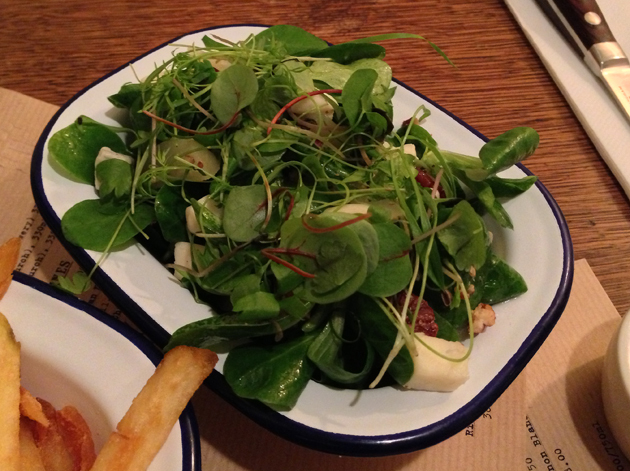 Tags: flat iron, fries, london, restaurant, review, salad, steak. Bookmark the permalink. 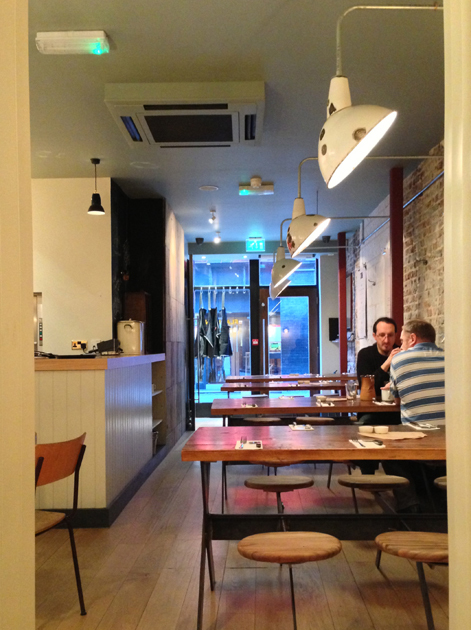 Previous post ← The Pig and Butcher review – a pig’s ear or worth a butcher’s?